From “Spectroscopy”, the study of the interaction between matter and radiated energy. Quantic Spectroscopy is the study of the fundamentals of what matter and energy produce in Techno music. For Quantic Spectroscopy, Techno is analyzed as a spectrum of sounds and different types of matter that together combined do the sounds of their mind. Dark ambiences mixed with small rays of colorful sound in other dimensions, creating textures and new physical relations in sound. Scientific, absolute, analytic and above all different in a kind. 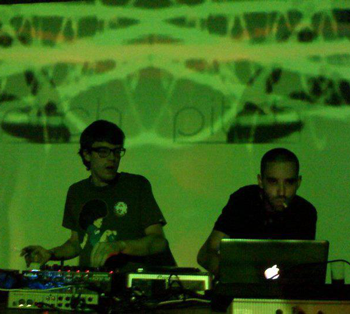 The dynamic duo is based in a long relationship of two guys (WireTap and Stig) from Oporto, Portugal who want to create and make a difference in the Electronic Music scene with their own specific vision of Techno. They have a lot of influences from well known artists filtering what they most like and giving it a new shape in another dimension just bringing the fundamentals of Techno music. You can find QS in labels like Transmissions, BCR, Heaven to Hell, Gobsmacked, Brickwork, The-Zone, Freitag, TMMR, Mechno, Shout Records, Voodoo Records, Impact Musique and a lot more to come! We have support from major artists like BCR Boys, iFormat, Mat The Zone, Luke Creed, 3Phazegenerator, Chris Liebing, Audio Injection, Woo York, Electrorites, Peder, Patrick DSP, Hugo Paixão, Dr. Hoffmann, Blood and Tears and other big artists as well!